So I have had several of you email me wondering . . . Is there going to be an Irish Chain Quilts Blog Hop??? Well, today I am excited to announce, that yes there is, and it is coming soon!!!! In fact, it starts next Monday!!! There has been a lot of behind the scenes planning and plotting for this and I can't wait to share it with you all!!! 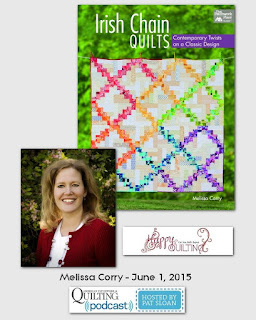 You can count on lots of Irish Chain Quilts Inspiration from some of my wonderful friends in the industry, as well as the building of a charity Irish Chain Quilt, and of course, lots of giveaways!!! Can't wait to see your blog hop and all the fun around it Melissa! It sounds like you organized it SUPER WELL! Oh, how fun. I will be following the blog hop for sure. Sounds like fun. I love a Blog-Hop for a good new book! I'll be hopping along! Yay! So exciting! I am in love with this book! Family road trip in July! Much more challenging when you're the mom but should be fun.